It's been nearly 5 years since my girl arrived but here are some box-opening pictures of my girl's arrival on the 5th of January 2010. Back in those days, the tins didn't exist so the dolls were shipped in large white boxes. After carefully removing the bubble wrap, my girl reveals herself. Closeup of the helmet. My photo doesn't do it justice. I've decided to call my girl 'Arya' after Arya Stark from the 'Song of Ice and Fire' books (which has now been made into the TV series 'Game of Thrones'). 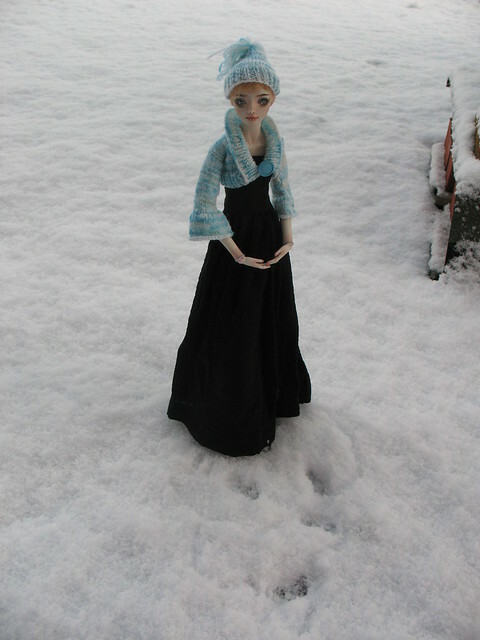 It was the middle of winter so I briefly took her outside in the snow for some more photos. What a lovely set of photos! I like how the old style of ED packaging provides such a contrast: rough cardboard and straps and a perfect, exquisite doll. Arya has always been one of my favorite Enchanted Dolls and I'm so happy to see her here! That dress is very flattering too! Has it really been five years already? Wow, time really does fly. I remember when you got her, and all the run-up to it, now I feel all nostalgic haha. Still as beautiful as ever! Oh, she is just beautiful- so on my wishlist! 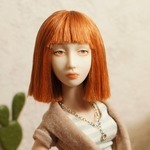 Suffering with a large dose of doll envy right now!!!! Els, so lovely to see this helmet again too...always one of my favourites! What a wonderful pictures - the first time you saw her so many expectations, and here it is, finally! I love to see the very first pictures, they can catch this first ecstasy. No matter how many years will pass, but this delight will be here forever! I really should take more photos of her helmet. I rarely put it on Arya 'cause she doesn't have any outfits that really go with it. 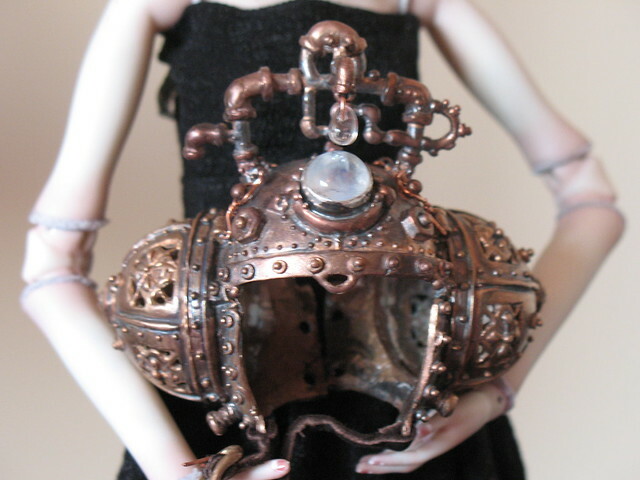 I think that someday, I'll commission someone to make a nice steampunk outfit for her to match the helmet. Thank you for sharing! Didn't see this box opening before. 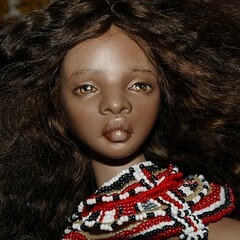 Such a beautiful photos of such a beautiful doll. So lovely to see these again, makes me nostalgic also, she is just so special! How time flies, and still her beauty will never fade! That's the perfect thing about porcelain isn't it? The beauty never fades!